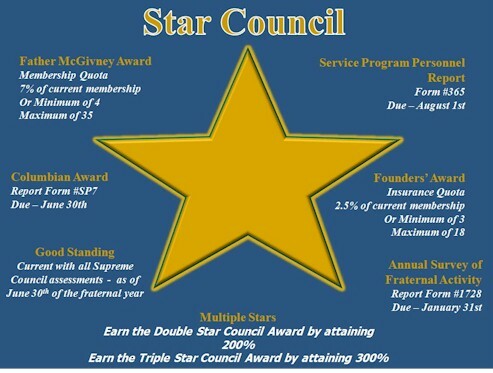 The Star Council Award recognizes outstanding achievement in membership, insurance and service program activities. 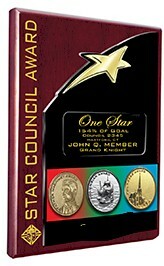 To be eligible to earn the Star Council Award, a council must qualify for all three other awards. 3) Achieve the Columbian Award requirements; form must be received in Supreme Office by June 30th. 4) In order to qualify for any awards, Councils must not be suspended by the Supreme Council office for nonpayment of per capita, Catholic Advertising, or supply charges. 6) Finally, to be eligible for the Star Council Award in the State of California, the Grand Knight and Youth Director must be fully compliant with applicable ‘Safe Environment Training’ requirements. Those members are the Grand Knight and the Youth Director of the council. 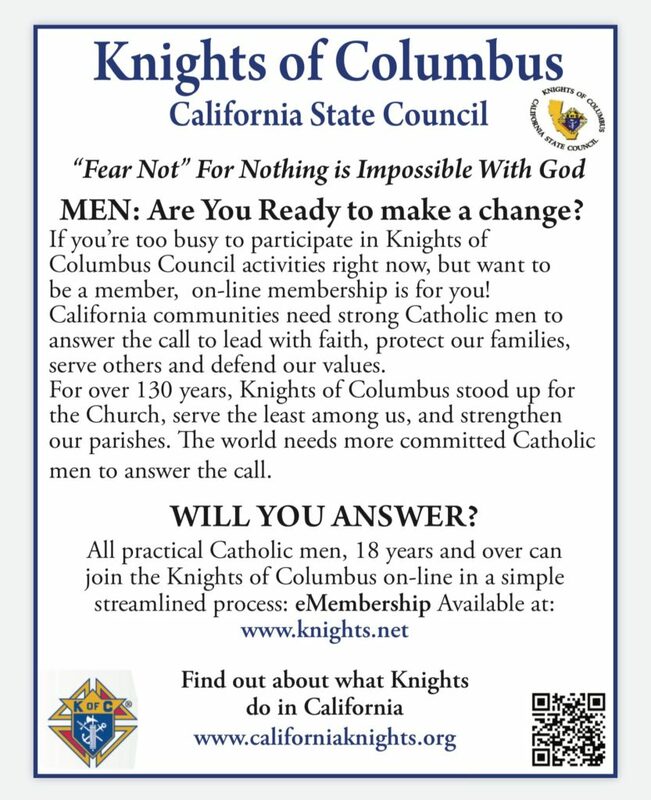 If either of those members has not completed the ‘Safe Environment Training’ through the Knights of Columbus Supreme Site, your council will not be eligible for considered for the Star Council Award even if steps 1-5 mentioned above have been met. The training for both council members can be found here. Any questions, please contact your District Deputy or Chapter Officers. The quota for Councils is a seven percent increase of membership additions over deductions based on total active membership of the Council as of July 1. Minimum of thirty members in the Council required. 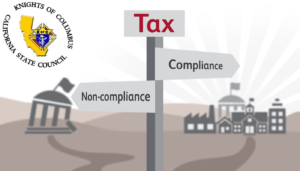 (Inactive insurance members are not included when computing the July 1 quota at the Supreme Council office). 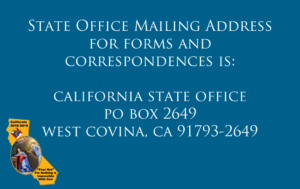 Additions will be credited for new members, juvenile to adult membership, reinstatements, reactivations, readmissions and reapplications received, processed, and recorded at the Supreme Council office between July 1 and June 30. Deductions to be charged against the quota include all suspensions and withdrawals processed and recorded at the Supreme Council office between July 1 and June 30. Net gain or loss to be affected only by items (b) and (c) in this section. Transfers in or out of the Council and deaths will not be counted toward or against the quota. 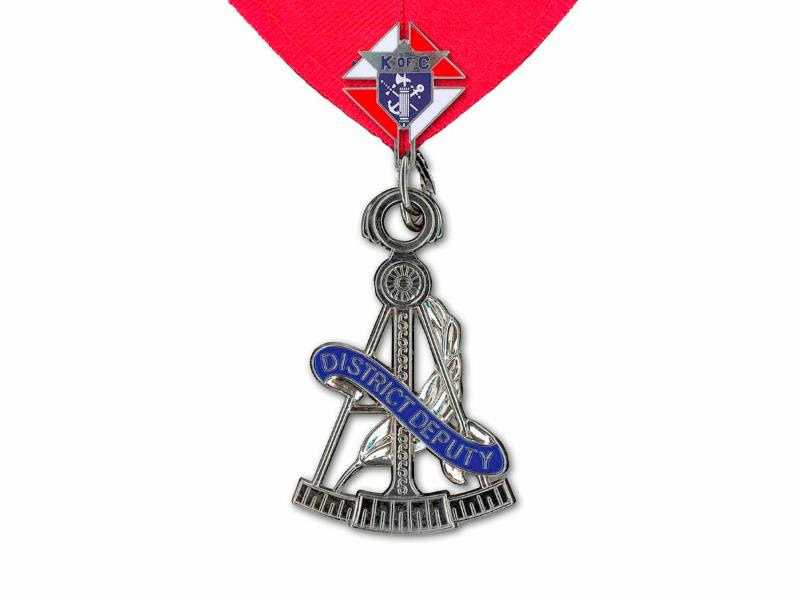 Monthly reports reflecting membership gains and losses will be supplied to each District Deputy, Grand Knight, Financial Secretary, and Membership Director. Achievement of the membership quota will be automatically determined at the Supreme Council office by membership transactions received, processed, and recorded by June 30. 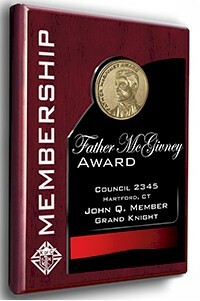 There is no application form to be completed for the Father McGivney Award. 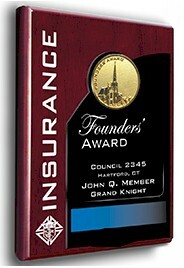 Achieve insurance member quota. The quota for councils with 30-100 members is a net increase of three members for the fraternal year. The quota for councils with 101 or more members is a 2.5 percent net increase in membership for the fraternal year. There is no application form for this award. Complete and submit the Columbian Award Application (SP7) found in the Council Report Forms Booklet (#1436) or at www.kofc.org/forms. Councils must conduct and report at least four major programs in each of the Service Program categories: Community, Faith, Culture of Life & Family. Completed applications must reach the Supreme Council office by June 30, 2019. Community – There are three featured programs: Habitat for Humanity, the Global Wheelchair Mission and Coats for Kids. Faith – The featured program for the Faith program is the Refund Supports Vocation Program (RSVP). 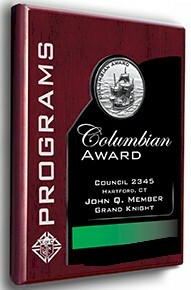 Family – The featured program for the Family Activities category is the Knights of Columbus Food for Families program. There are also required programs for each of the four categories.